Here is a FREE Holiday tree prewriting activity page to practice visual motor skills. 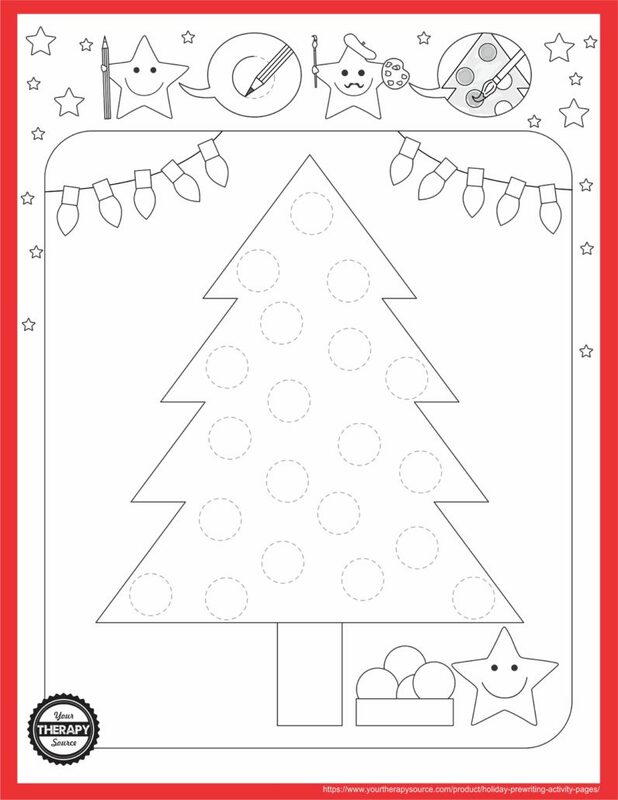 The child can practice tracing each of the small circles to complete the holiday tree. Once all the circles have been drawn, paint or color in the picture. This is a great, quick NO PREP activity to encourage visual perceptual skills during the December holiday season. 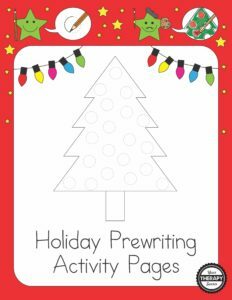 DOWNLOAD the free Holiday tree prewriting activity page. This activity is from the Holiday Prewriting Activity Pages packet. The download includes 20 black and white December holiday pictures to trace and color. This is a “just right” activity for children who are learning to write, draw and color. Each picture has dotted lines for the child to trace to practice visual motor skills. Once completed, the child can paint or color the picture. Various prewriting practice strokes are included throughout the packet such as vertical lines, horizontal lines, diagonal lines, crosses, circles, triangles, wavy lines and more! The 20 pictures to complete include: holiday tree, present, candle, ornament, star tree, stocking, snow globe, santa, reindeer, bell, hanging ornaments, holly wreath, gingerbread men, gingerbread house, snowflakes, candy canes, holiday lights, outdoor trees, fir tree and holiday tree with ornaments.